There are never enough hours in the day, right? Well, there’s nothing we can do about that. But with a little help, we can offer suggestions to help you get more done in the time you have. Productivity is all about efficiency. Regardless of how good you are at your job, you can always push yourself to do better. 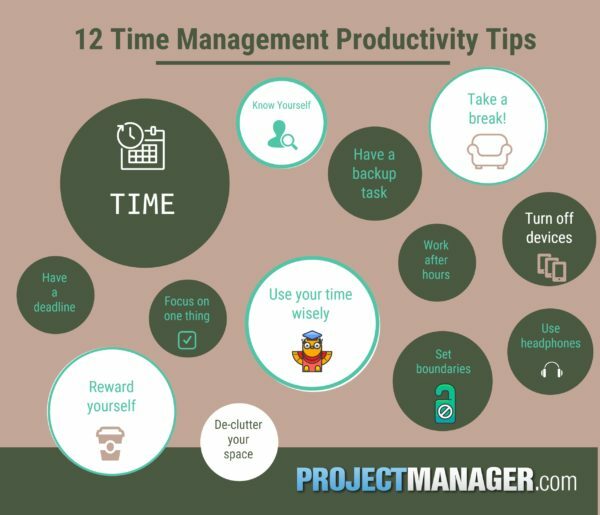 That’s why we’ve assembled this list of 30 productivity tips. It may not add a 25th hour, but you’ll get more done without pulling out your hair. We have a tendency to believe we can accomplish much more than we really can. It’s fine to be ambitious, but if you’re setting up daily goals that are unrealistic, you likely won’t complete that to-do list and on top of that, you’ll feel the worse for it. Instead, set up one task list with some medium-sized ones and a few small ones. This will move your to-do list forward, and give you that needed psychological boost when you cross out tasks and look towards the next day’s tasks. There are big tasks and then there are massive tasks. Some larger tasks are too complex for one line on your to-do list. You’ll just end up getting frustrated and wasting too much time working on something that should have been divided into separate tasks or even separate phases. 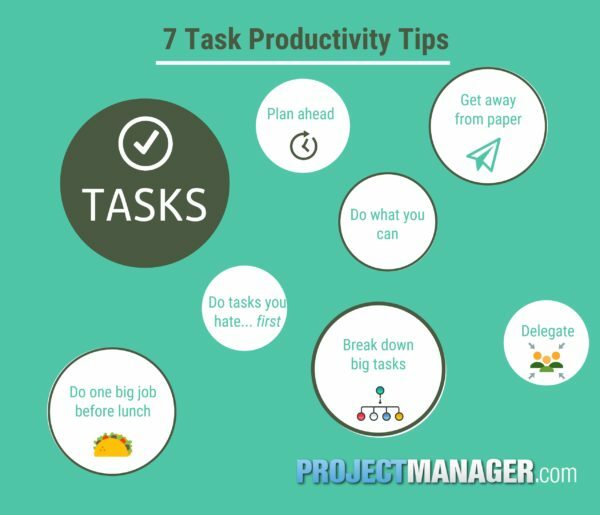 Find the big tasks that can be divvied up into many smaller, more manageable tasks, so you have a realistic chance of getting it done within the time frame you had planned. Paper is a great technology, but there are other mechanisms you can use to replace paper and increase your productivity. An online task management tool can offer more features than scraps of paper or post-it notes. Paper also is static. You can better organize your tasks across all your devices, update them wherever you are and easily share them if you want to delegate. At the end of the week, take a 10 minutes to look at the week ahead. Use this time to map out an action plan. This provides a rough outline of what you’ll need to do and allows you to manage that time in advance. You’ll feel better when the next week starts knowing you have a plan in place to tackle the week’s work. Along those lines, you might want to do a mini-version of the same exercise daily, looking forward to the next day and the tasks you’ll need to accomplish then. Those awful jobs, the ones you just can’t stand, are going to hang over your head and color your day until they’re off your to-do list. So, why not strike them out as soon as possible? It’s a psychological trick. You’re still doing all the tasks, the ones that are tough and the ones you love, but by getting the difficult ones out of the way first, you’re likely to get them done faster. Plus, for harder or more complex tasks, you might find you need more time to complete them than you planned. If you wait until the end, you might miss important deadlines. If you can finish one significant task before you break for lunch, you’ll feel a sense of accomplishment. You got that done! Now you can take it easy for a bit, eat, relax and get your energy up for the rest of the day. You’ll find that when you return to work you’re refreshed and won’t feel as overburdened. There are probably tasks on your to-do list that you could pass on to someone else. If you put everything on your shoulders, and yours alone, you’re going to burn out. Learn how to delegate. Go through those tasks on your list, and define which don’t require your specific skill set and can be given to or hired out to someone else. By focusing on what only you can and should do, you give those important tasks your full attention, and you set yourself up for success. Email is one of the many ways we receive important work updates, and there’s a natural impulse to check your inbox obsessively. It becomes a habit, but it’s not an effective one. It’s best to schedule just a few times during the day to log on to your email account to see what’s collected over time there. If there’s some emergency and you must be reached immediately, then set up a system for that with your colleagues. Don’t let email compulsion pull you from productive work habits. Another productivity tip about emails is how to respond to them. You’re going to get missives that will require a simple answer. Do those immediately and get them out of the way. But others are going to involve more time and thought to respond properly. Put them aside for later when you have a block of time to devote to the replies. Email, like social media, triggers our reptilian brain. It makes us want to check it first thing in the morning in fear that we’re missing out on something. But you have other priorities on your to-do list, exercise routines to complete, and breakfast to eat. And personal or work emails have a way of feeling more urgent than they really are in those wee hours. Make it a personal policy to not check your email first thing in the day. That’s a surefire way to stay on top of your morning routines. You email is going to get full fast, and that’s both a strain on the software and your sanity. Who wants to look at those notifications that go into the double or triple digits? You can always archive correspondences that are important, but you can also bulk archive emails and search for them when you need them. So if you haven’t done it regularly, at least do a quarterly archive or purge of your bloated inbox. It’ll feel good to start with a clean slate. 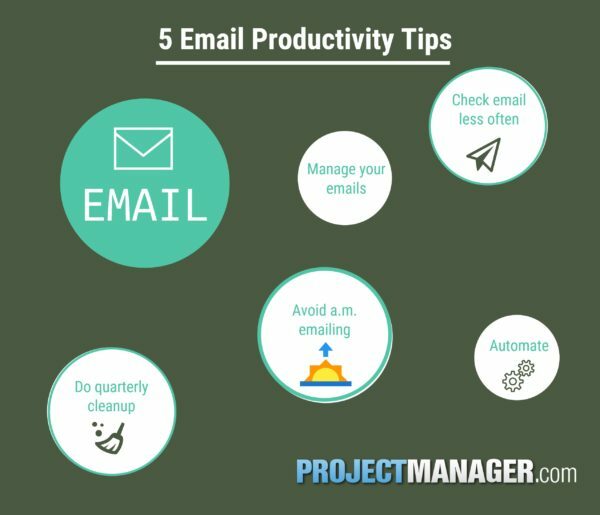 Use email tools to their full advantage. Filter shopping or other unessential emails into lists automatically. You can even filter emails by individuals or by group email lists you might be on into targeted folders for that activity too. Those might be digests or email threads you’re cc’d one that you might want to check in with when you have time, but you don’t need them blocking out important other emails you can’t afford to miss. Meetings are notorious time-wasters. But they can be efficient and productive, if you plan for them and schedule just the time you need. Don’t take an hour when 20 minutes will do. Get across the information you need quickly so everyone can get back to doing their jobs. How many times have you been to a meeting that had no reason to be a meeting? Many updates or documents reviews or information gathering can be more easily and productively done through a mass email or a group chat. Meetings should be action or decision-based; if they’re not, then you don’t need to disrupt the workday with them. If you have a lot of legitimate meetings to schedule, don’t stagger them throughout the day. That’s only going to interrupt everyone’s workflow. You don’t want to get into a groove on some task only to get pulled away for a meeting and then have to return to the work. 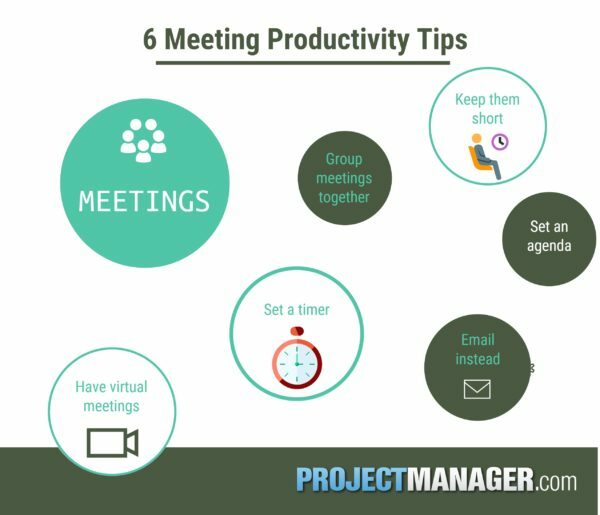 By grouping all your meetings one after the other, you keep people on meeting-mode and then they can get back to work-mode. Sometimes you’re going to have a meeting with someone outside of the office, or you might work remotely and are scheduled to meet with people who don’t share the same workspace. Instead of losing valuable work time traveling, see if you can take the meeting by phone or Skype or any other number of virtual conferencing options. Some people like to talk, and they can hijack a meeting. Instead of looking at the clock and getting more and more frustrated, run a meeting with an agenda to keep it on track. Send out that agenda to the meeting participants before the meeting so they can familiarize themselves with the subject and add anything they feel in important prior to the meeting, so it too can be part of the agenda. Remind everyone you’ll be sticking to the agenda, to prevent the hijackers from getting the floor. Phone meetings can take time to get started, as people like to beginning with friendly conversation unrelated to the job at hand. While it’s important to be civil, if you set a timer, giving yourself only 10 or 20 minutes to get the phone meeting done, then you’ll be forced to cut to the chase as opposed to getting lost in chit-chat. When do you do your best work? If you’re a morning person, then schedule those major tasks first thing in the day. Conversely, if you work better later in the day, then have your schedule reflect that. By knowing when you’re focused and high-energy and when you need a bit of downtime to recharge, you’ll be able to schedule your day more productively. There will always be those short blocks of time in your day, maybe 15-20 minutes before or after a meeting or the completion of one task and the start of another. Use this time. You can schedule paperwork for this sprints and get that busywork off your desk. What!? Hear us out. You should schedule your time so that you’re home daily for dinner, and your weekends are free to do anything that’s not work-related. However, there can be clerical work or just something that needs a brief cleanup that you can accomplish at home. This isn’t thought-intensive work, but just stuff you can get out of the way while watching TV or listening to music, so when you get back to the office you can hit the ground running. Often you have deadlines at work, but not always. Regardless, a deadline makes the work more real. You have to have it completed by a certain time, and so you have to formulate a realistic schedule to get that work done in time. A deadline is a great way to rid yourself of wasteful procrastination that only gives you more stress and work to do in less time. This you like. It’s important to have some periods of downtime during the day to recharge your batteries. Take breaks throughout the day helps reduce stress, makes you healthier and increases productivity. Don’t take our word for it, the Harvard Business Review writes about the value of downtime. These productivity tips just keep getting better and better, right? But seriously, often incentives will help you push through for that carrot of 10 minutes of social media scrolling or a specialty coffee drink. If you set up little rewards for yourself all day long, it makes working more productive and fun. You should remain focused on one task and not multitask, but sometimes you’re blocked by someone and have to wait around for them to deliver what you need to move on and finish. That’s why you need to have backup tasks ready. Instead of being idle, now you can switch to some other task and keep working until you’re clear to return to the other work. Multitasking usually means doing a lot of things, but you don’t always do them so well. By focusing on one task at a time, you give it your undivided attention, which means your work performance is better and you are therefore more productive. We’re not going to ask you to police the time you spend on your phone or computer. That would just make you want to do it more. But, admit it, your phone or computer can be a big distraction. What are my friends up to? Has anyone sent me something? What’s happening in the news? Maybe I’ll lose myself in a clickbait article. Sure, go ahead, when you’re giving yourself a reward (see above), but otherwise, keep distractions at a minimum. Depending on your work environment, it can get pretty distracting: noisy, talkative coworkers and other interruptions can really mess with your concentration. If you put on your headphones, though, and listen softly to music, it’s like a little vacation and gives you the sense of privacy and peace you need to focus. Sure, some people like a messy workspace. Some might even thrive on the chaos. But most of us are going to be more productive when the place where we work is well-organized. You want to know where everything is at-a-glance, and have room on your desk to work without distraction. It’s not rude, sometimes it’s necessary to put up a wall. That wall can either be virtual, like setting your Skype status to “Do Not Disturb”, or quite real, like closing the door to your office or secluding yourself in a conference room. You can also set office hours with your teammates, say from 2-5 you’re available for pop-ins, but otherwise, you’re not to be disturbed. If you don’t set these boundaries, the reality is you’ll be regularly disrupted from your important work.